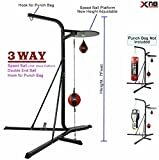 Punching bags are great for boxers and other fitness enthusiasts however without an appropriate and sturdy stand, they would be futile to own. 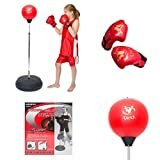 It is therefore as important or to put it in better words, more important to choose the right punching bag stand then it is to pick a good punching bag. 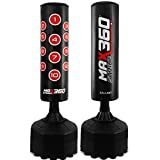 Here is a list of the most popular punching bag stands that you could pick from as these are rated by customers to give you a good idea on how they were received. 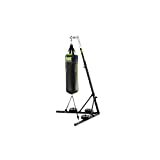 SAVE SPACE - Struggled with the limited space for your loving punch bag? 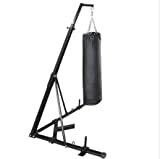 We offer you the best solution - a PORTABLE & FOLDABLE punching bag stand that is versatile yet strong! 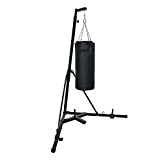 MULTIFUCTION - This punching bag stand provides 2 training methods, allowing the user to maximize both speed and power. 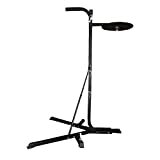 Simply attach a speed bag or a heavy punching bag to this stand to suit your personal needs. STURDY & DURDY - Train in comfort in your own workout room, basement, den or bedroom with the help of this everlasting heavy bad stand. It is constructed of sturdy and durable steel that provides a solid foundation that will hold the bag firmly.